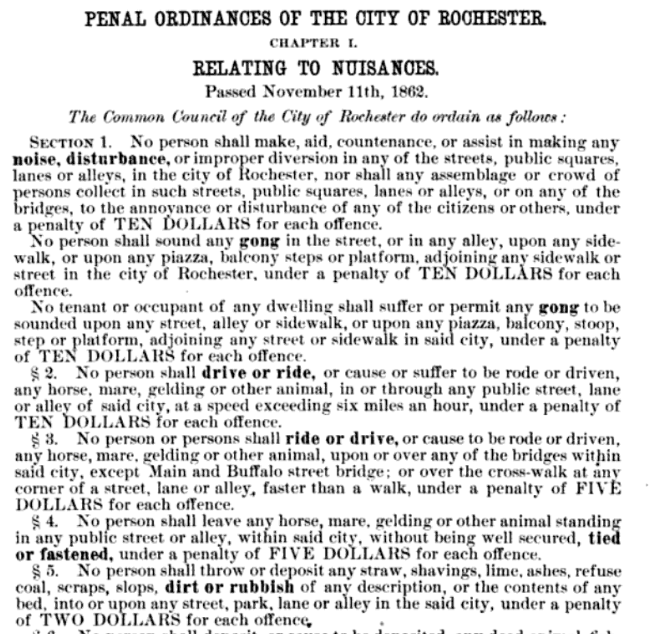 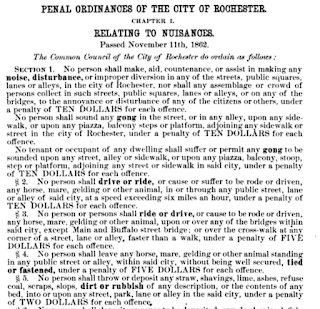 Section 1: No person shall sound any gong in the street, or any alley, upon any side-walk, or upon any piazza, balcony steps or platform, adjoining any sidewalk or street in the city of Rochester, under a penalty of TEN DOLLARS for each offense. 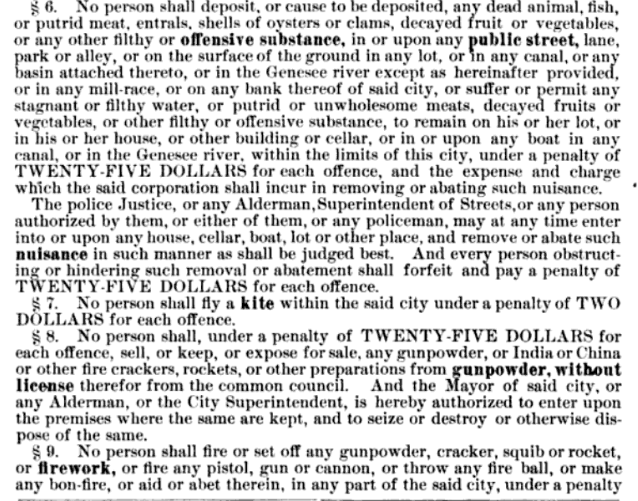 Section 7: No person shall fly a kite within the said city under a penalty of TWO DOLLARS for each offense. 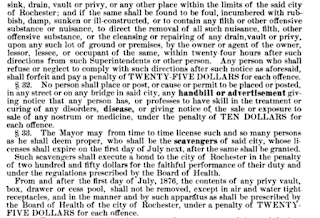 Section 11: It shall be lawful for any person to bathe or swim in the Genesee river, or in the Erie or Genesee Valley canals within the city of Rochester, provided such persons wear tights, pants or shirts. 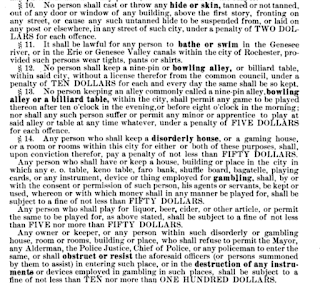 Section 13: No person keeping an alley commonly called a nine-pin alley, bowling alley or billiard table, within the city shall, permit any game to be played thereon after ten o'clock in the evening, or before eight o'clock in the morning ; nor shall any such person suffer or permit any minor or apprentice to play at said alley or table at any time whatever, under penalty of FIVE DOLLARS for each offense. 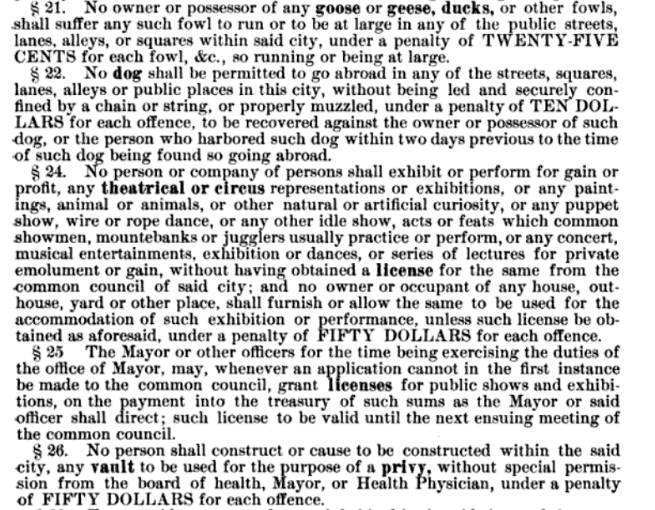 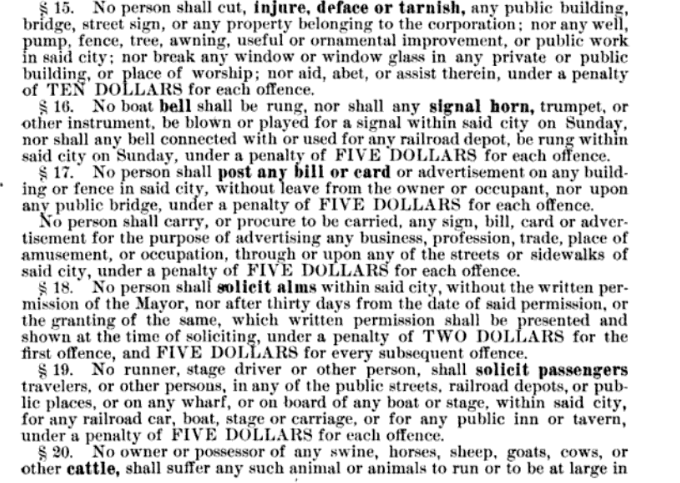 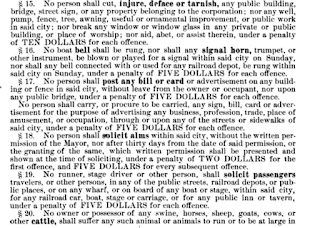 Section 21: No owner or possessor of any goose or geese, ducks, or other fowls, shall suffer any such fowl to run or to be at large in any of the public streets, lanes, alleys, or squares within said city, under a penalty of TWENTY-FIVE CENTS for each fowl, etc., so running or being at large. 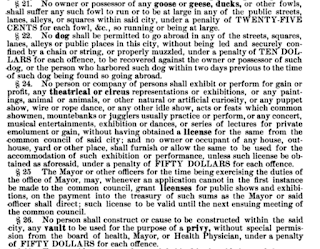 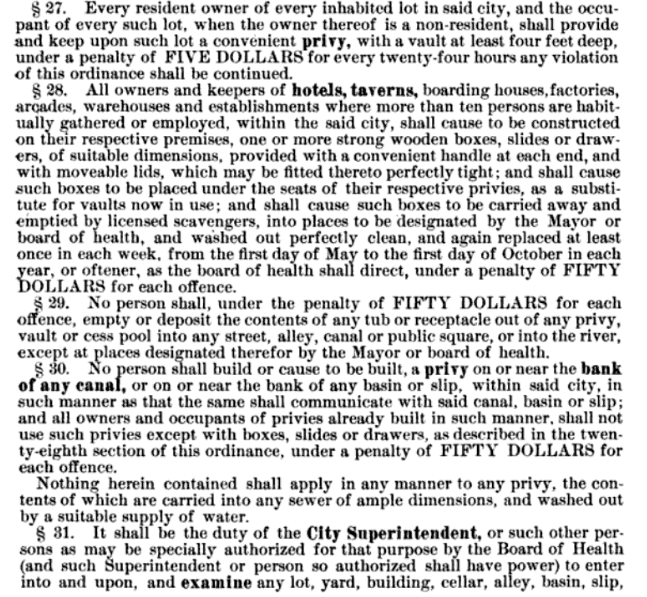 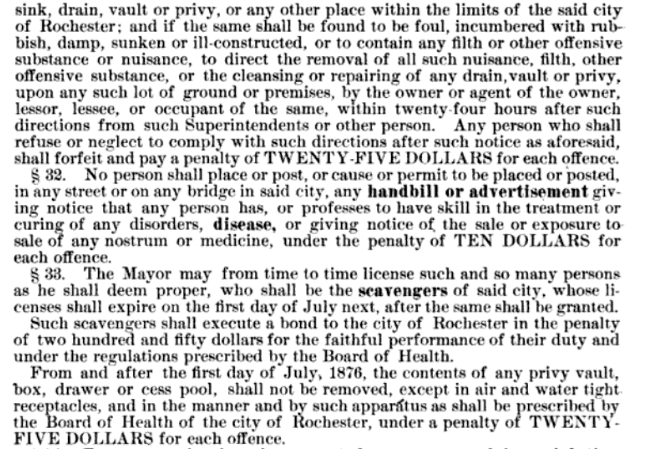 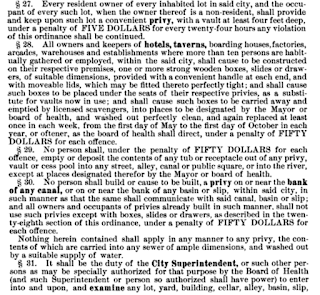 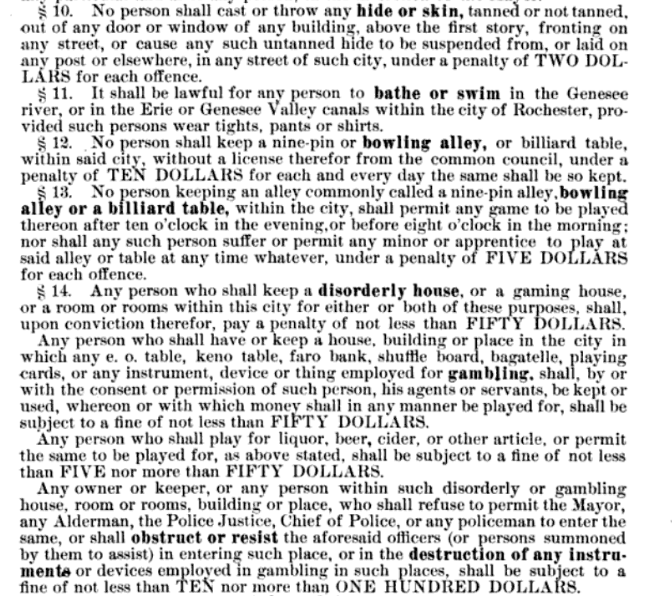 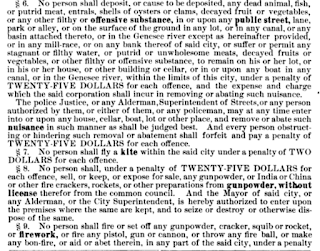 Section 29: No person shall, under the penalty of FIFTY DOLLARS for each offense, empty or deposit the contents of any tub or receptacle out of any privy, vault or cess pool into any street, alley, canal or public square, or into the river, except at places designated therefor by the Mayor or board of health.